John Bolton Says U.S. Is Considering ‘Libya Model’ for North Korea“Libya’s giving up its nuclear arms was used as an invasion tactic to disarm the country,” a North Korean official said in 2011. Cardi B Is the U.N. Ambassador We NeedThe rapper shared her thoughts on the situation in Libya. Progressives Need a New Foreign-Policy Vision. 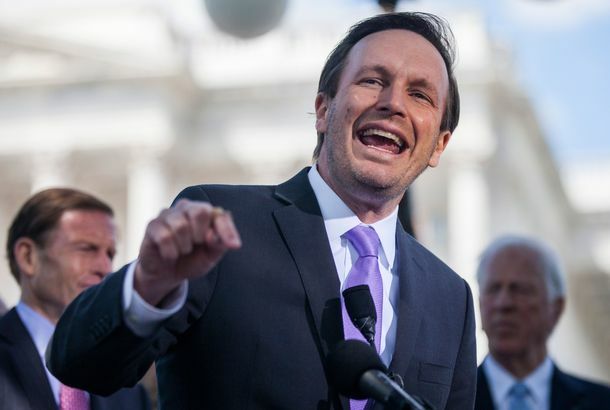 This Senator Says He Has One.Democrat Chris Murphy of Connecticut is trying to sell liberals on restrained realism in Syria and other global hot spots. U.S. Strikes ISIS Camps in Libya, Killing 80 MilitantsB-2 bombers and drones wiped out two camps 28 miles outside of Sirte. 5 Foreigners Dead in Deadliest Libyan Attack Since BenghaziIn the capital city of Tripoli. Libyan Militants Really Enjoying the Pool at the American Embassy in TripoliThe facility was evacuated in July. Libyan Prime Minister Kidnapped, or ‘Arrested’ by MilitiaOver the U.S. raid that captured an Al Qaeda suspect. The Benghazi Drama Is Never Going to EndSeriously. Fox News Boots Guest for Rudely Calling Them Republicans Well, I never! Muammar Qaddafi’s Former Spokesman Captured in LibyaAs information about what happened in Benghazi continues to emerge. Everyone Is Butchering ‘the Buck Stops Here’Harry Truman’s famous saying didn’t mean that the president is responsible for everything that happens. Ambassador’s Family Says His Death Shouldn’t Be PoliticizedUnfortunately, it’s too late. Romney Campaign Accuses the White House of ‘Doubling Down’ on Libya ‘Denial’More malarkey? State Department Denies Connecting Libya Attack to Anti-Islam Video ProtestThat conclusion was made by “others,” officials say now. Obama’s Libya Controversy Sparks More Squabbling in Romney CampIs insisting “it’s the economy” stupid? CNN Used Ambassador Stevens’s Journal As SourceNor did they mention that they had it. Tense Calm Descends on Muslim World After Protest-Less Saturday After twenty-some countries were racked by anti-U.S. demonstrations on Friday. President Obama and Hillary Clinton Mourn Americans Killed in Libya Meanwhile, Libya’s president suggests the attack was premeditated. Romney Blames, Exonerates Obama on Libya AttackAdviser says, “This is amateur hour,” referring to Obama. Four Arrested in Libya Attack, Officials Say Al Qaeda Connection Is UnlikelyNor was it premeditated. U.S. Sends Marines and Warships to Libya, Begins Hunt for Ambassador’s KillersNo group has taken responsibility for the attack. John Heilemann: Romney’s Bungled Libya ResponseHeilemann wonders if we will look back on Romney’s response as the moment he lost the election. President Obama Dusts Off Temperament Attack for Mitt RomneyRomney, like McCain, has a “shoot first, aim later” approach to things. Romney Agrees, Disagrees With Obama on CairoRomney’s response to the Cairo protests is not getting any stronger. Juxtaposition of the DayWhat a difference a few hours make. U.S. Ambassador to Libya Killed in Attack During Embassy Protest [Updated]Christopher Stevens and three members of his staff were murdered at the American Consulate in Benghazi. Lockerbie Bomber Dies in Libya Abdel Basset al-Megrahi was released from a Scotland prison in 2009 because of his illness. Ex-Libyan Minister Found Dead in Danube RiverIt’s unclear if the death was a hit. Libya Demands Qaddafi Son Back After Inflammatory Remarks Sons of a fallen dictator’s shouldn’t run their mouths. Libyan Militia Captures Qaddafi’s Son, Saif al-Islam [Updated]They want him put on trial. Make It Stop, Herman CainHe says the Taliban is involved in the Libyan government. Herman Cain Makes Rick Perry Look Like a Genius [Updated]Watch Cain struggle to answer a basic question on Libya. Is the Al Qaeda Flag Flying Atop the Courthouse in Benghazi, Libya?It certainly appears so!